Proper watering is the most important factor in keeping plants growing vigorously, yet it is the most difficult procedure for which to give standard recommendations. Watering needs vary with individual plant requirements as well as the soil type, drainage, exposure and weather. Observing your plants and checking the soil to determine when they need water. Dig down about six inches just outside the root zone. If the soil from this area tends to crumble when you squeeze it, you should water the plant. If it forms a moist ball it does not need water. 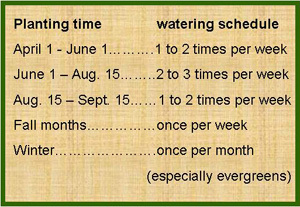 The chart to the left gives a tentative watering schedule for #1 and #5 container grown plants for the first month after planting. Adjust the schedule for smaller (more frequently) or larger sized container plants (less frequently). When you do water, soak the ground thoroughly enough to saturate the root zone, but allow adequate time between waterings to permit the soil to drain and air to penetrate into the root zone. As the plant becomes established the roots will be growing into the surrounding soil giving the plant a larger volume of soil from which to draw water. 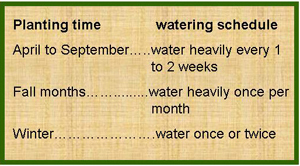 You should gradually extend the period between waterings over the second month until you reach a schedule similar to the one to the left for bare root and balled and burlap plants.